Over time, the mortar between the bricks on your chimney could degrade and break down. This is due to the extreme elements of the outdoors they are exposed to on a daily basis, especially in more seasonal climates. In extreme cases, the mortar can wear right through, exposing even the inside of your chimney to the outdoors. Having any compromise to the soundness of your chimney will lead to moisture penetration and eventual collapse. And this can prove detrimental to not only the chimney itself, but even to the foundation of your building. So addressing this issue as soon as it is discovered is imperative for the soundness of your building and safety of those living there, not to mention the neighbors. 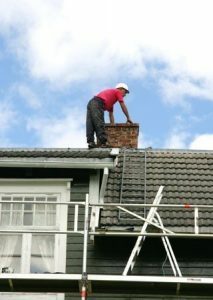 Fixing the degraded mortar on your chimney, known as ‘repointing,’ is imperative as soon as the issue is realized. This is because the interior wall of your chimney is not designed to withstand the harsh elements, moisture or ice that mortar degradation will introduce. Subsequently, not only will the entire wall from the roof down to ground level face vulnerability to leaking and rotting, the foundation is at serious risk. With these compromises, your home is open to growth in black mold, a very dangerous mold arising from moisture exposure. When breathed in, black mold spores can actually cause irreversible lung damage. Exposing your foundation to the elements also opens the possibility of a cracking foundation. So having your crumbling chimney mortar professionally repointed is crucial at the first sign of problems. Otherwise, in addition to the comparatively nominal cost to repointing, you could face very costly foundation repair and black mold removal fees. Keeping moisture out of the home is the goal of every homeowner. And a crumbling chimney is the antithesis.